When, during the Vaisakhi of 1978, unarmed Singh’s went to protest the insult of Guru Sahib being done by the fake Nirankaris, the unarmed Singh’s were fired upon and 13 were martyred while countless others were injured. The spilt blood of the martyrs had a deep effect on Bhai Kulwant Singh and as a result, he began attending kirtan samagams and would long for the blessing of Amrit day and night. By the grace of the Guru during the 1979 AKJ Holla Mohalla Samagam at Anandpur Sahib, he presented himself before the Punj Pyaaray and was blessed with Amrit. Bhai Sahib would read books on Sikh history and would try to mould his life to match those of old Singhs. He would always be consulting with other Singhs on the issue of punishing those who had killed Singhs. When the fake Nirankaris held a meeting in Jagadhri, Bhai Sahib and his companions attacked with fervor and caused the Nirankaris to run away in chaos. 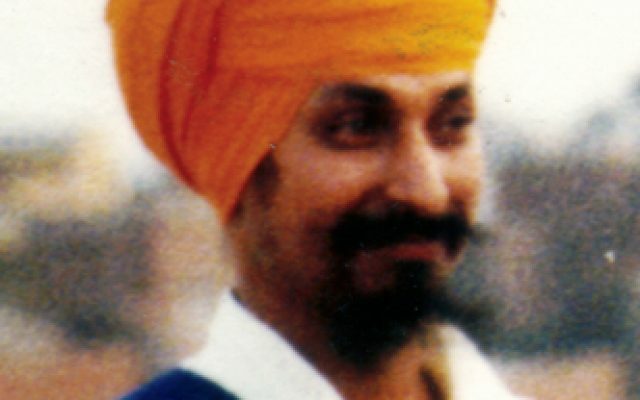 In September 1979, the Singhs held a camp in which the Singhs, in addition to learning gurmat, also learned weaponry. Bhai Sahib took part in this camp with a desire to learn the use of weapons. During this camp, Bhai Sahib met Bhai Sukhdev Singh, Bhai Kulwant Singh Nagoke, Bhai Sulakhan Singh, Bhai Balwinder Singh, Bhai Vadhava Singh, Bhai Anokh Singh, Bhai Manmohan Singh and many other Singhs. The Singhs who taught the use of weapons loved Bhai Sahib, and they began to stay together in the form of a Jathebandi. All the Singhs had the goal of finding and punishing the killers of Singhs and those who would insult Guru Sahib. The government had no idea who conducted these actions. All the Jathebandis in the complex, upon hearing the news of the Shaheedi did a final ardas for Bhai Mengha Singh, and upon seeing the Shaheed for the final time, heaped praise upon his bravery. Whoever meditates upon the Guru with a pure heart, for certain, gets the reward. May we be a sacrifice unto this first Shaheed, this blessed soul. This was the first Shaheed who’s body was cremated in the Darbar Sahib complex, despite the protestations of the SGPC president. Bhai Sahib was cremated close to Sri Manji Sahib.